I'm still coming down from the elation of a mammoth two week holiday to Indonesia with some of my favourite people. We started our trip, fresh off a 25 hour journey, by climbing Mount Rinjani in Lombok - the second highest volcano in Indonesia, and an unexpectedly, ridiculously tough climb. Our porters and guide did it in flip flops, shouldering an incredible amount of gear; tents, food, water, the lot. 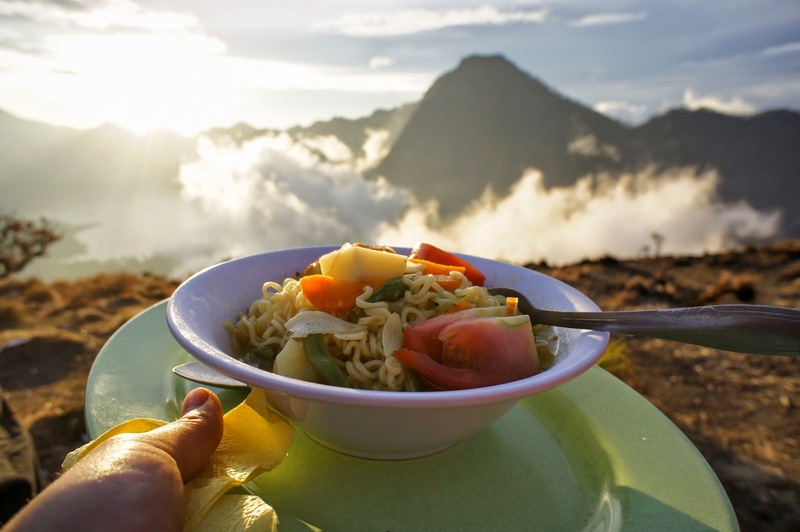 We had a proper cooked meal for breakfast, lunch and dinner - at basecamp, around 2,500m, we ate noodles in soup with tomatoes, green beans, potato and a deep fried, crisp hard-boiled egg, soaking up the resultant soup with freshly steamed rice as the sun set in front of us. We then got up at 3am to haul ourselves to the summit at 3726m, scrabbling on our hands and knees for several hours. Sandy rocks and stones slid underneath you, so that for every step you took, you slid down another two. It was mentally as well as physically challenging. I cried more than once. The euphoria when we reached the top was incredible; we clutched each other, gulping back relieved sobs, before we could take in the view. After a 6 hour downhill trudge, we stumbled onto Gili Trawangan, transported by horse and cart to the most wonderful villa we could have asked for and proceeded to thoroughly relax. Any kind of movement for the next 3 days produced gasps and whimpers. 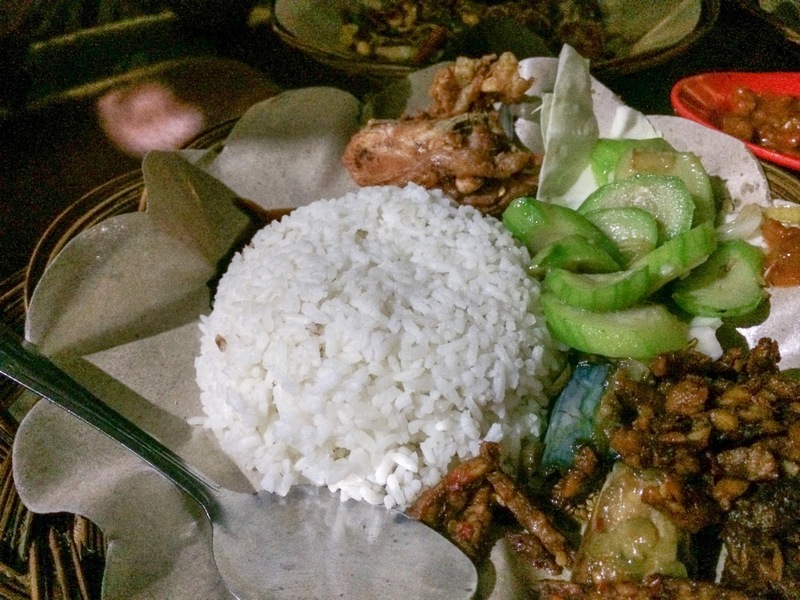 We carefully avoided the abundance of pizza and burgers, and opted instead for Indonesian food as much as we could find it, usually on quite a limited menu. 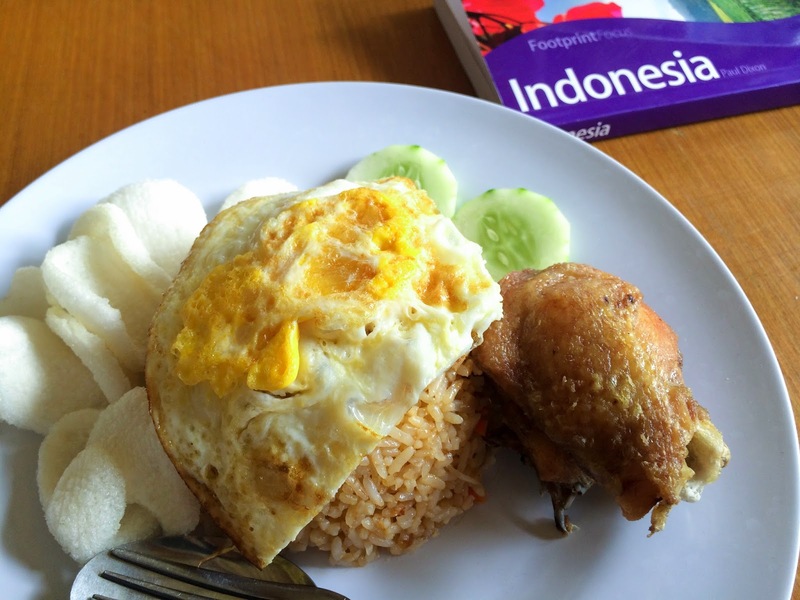 Our staple diets became nasi goreng (fried rice, and considered Indonesia's national dish) or mee goreng (fried noodles). 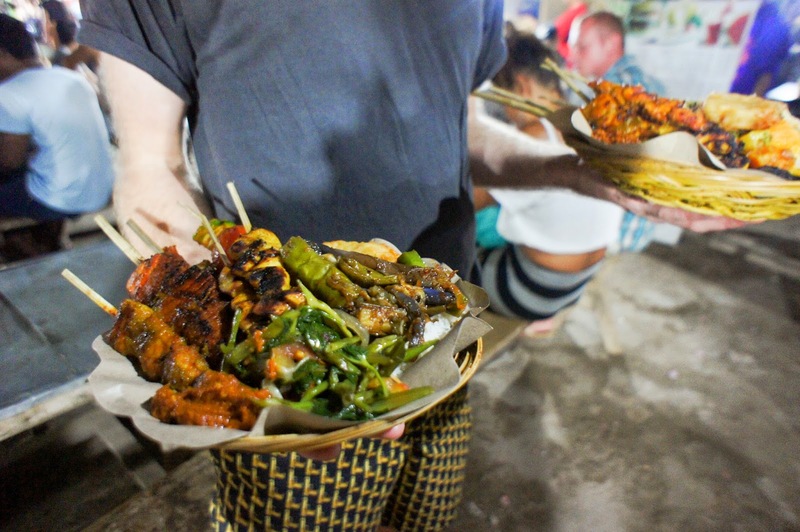 Made's Warung, on the northern tip of the island and virtually next door to our villa, served up the best iterations we had of these. 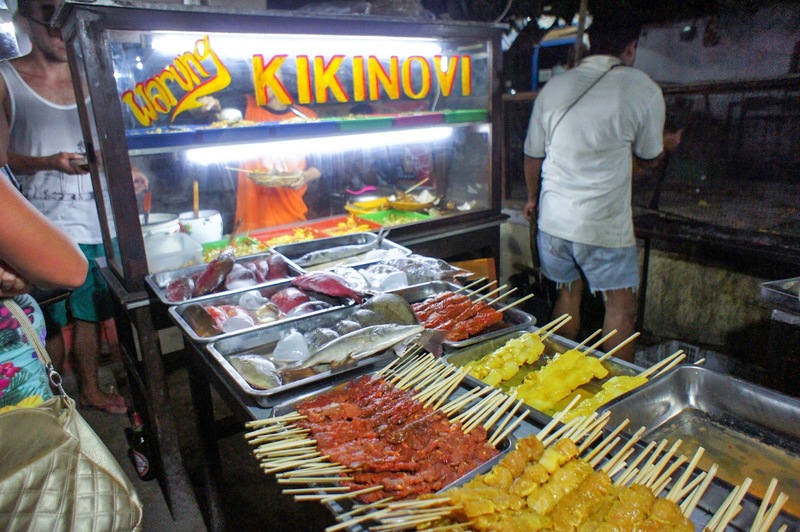 Otherwise, the daily night market was our best bet, nestled amongst the bars on the main strip, flaring grills and eye-watering smoke mingling amongst the plastic tables and tables. Here, we flitted between stalls pointing at whatever we liked to be cooked to order. As there were 6 of us we managed to try a decent variety; freshly barbecued fish was butterflied and flipped on the grill frequently, brushed with a slick of spicy sambal. We picked various curries and vegetables to be piled onto a plate, while the vendor totted up the spend, which rarely came to more than £2 or £3. Sate sticks of calamari, beef, chicken and fish were smoky and meaty, plated with some rice, peanut sauce, and a choice of three sides. All the other Westerners were rejecting the sambal, and it was a fiesty number that made us sweat and reach for the tissues. But it was addictive. 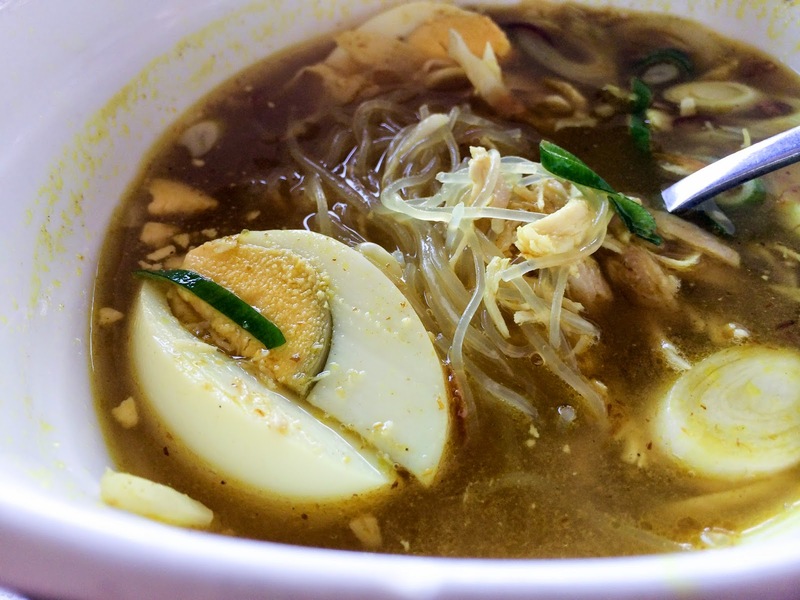 A chicken soup (Soto Ayam) was produced in seconds, a case of assembling and garnishing. 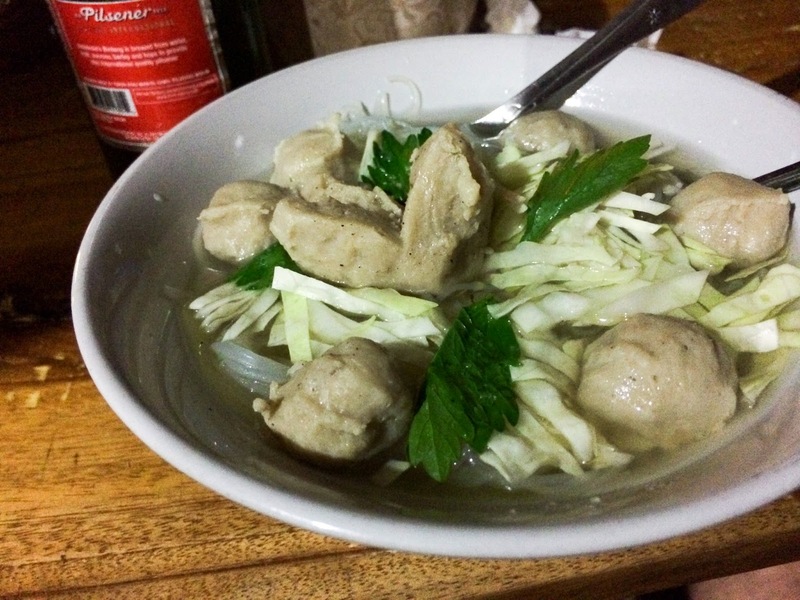 The soup was rich and sweet, bobbing with crunchy cabbage and soft chicken. It was spicy but with a deep roasted flavour, rather than the brightness of fresh chilli. The stall holders were slightly bemused by our scattergun approach, and it was only when we promised them we'd return the crockery from where they came from did their brows unfurrow. Bintang, the local beer, was abundant. 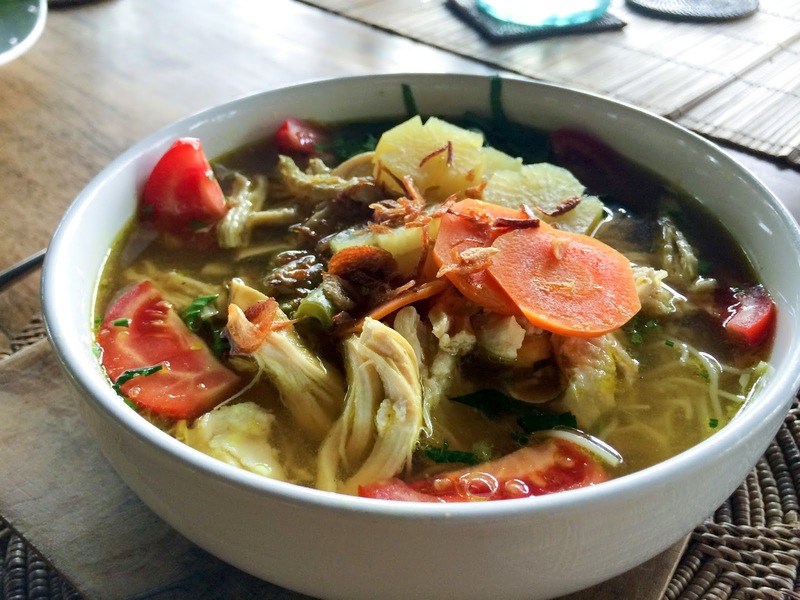 This kicked off a slight Soto Ayam obsession for me - chicken soup? Just chicken soup? But it was so much more than that. I ordered it again at a posh beachside restaurant, and something completely different turned up. The broth was clear but stained yellow, strong with lemongrass. Seemingly everyone has their own take on it. 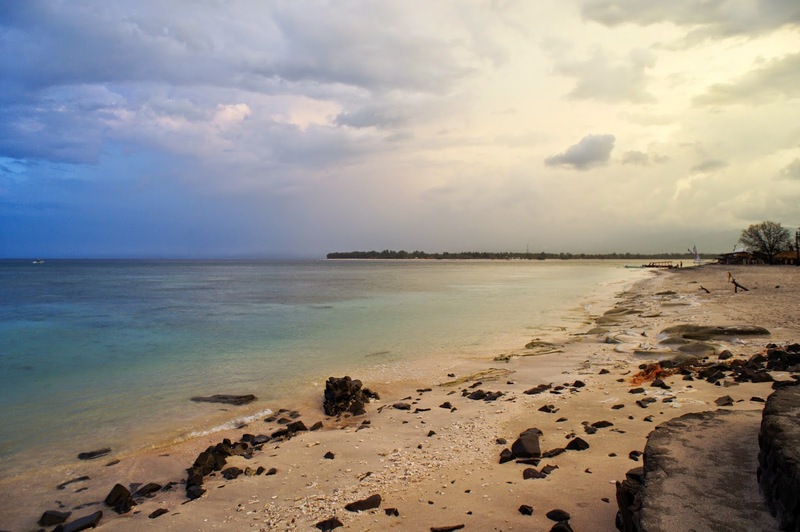 We moved on to Gili Air, to stay in basic beach shacks complete with swinging hammocks for a simpler life. 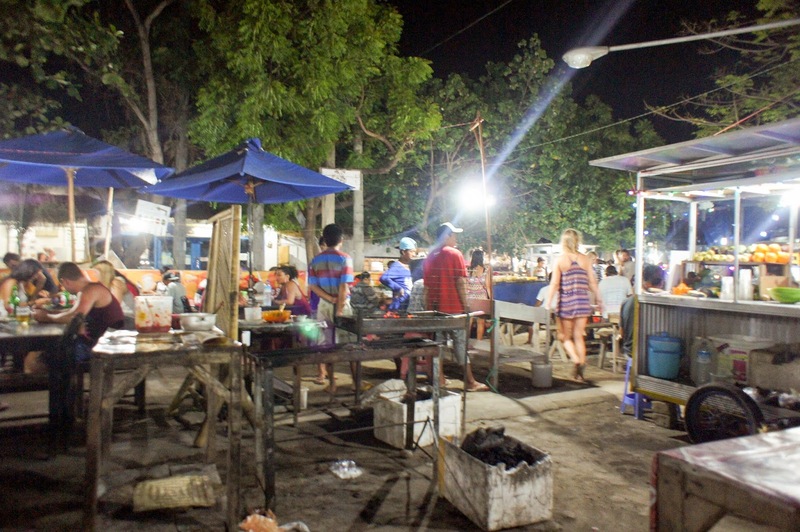 Here, beach barbecues dominated; the best we had was at Chill Out Bar, where we were able to select our own fish for the grill. We feasted on a huge jackfish and giant prawns while our toes sank in the sand. Otherwise, it wasn't immediately easy to find cheaper, more casual food. 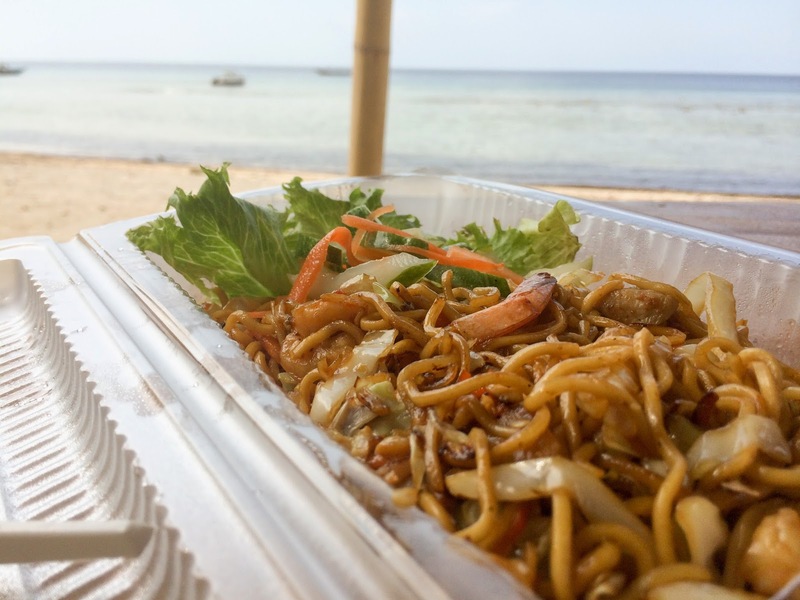 Unlike Thai islands, the Gilis aren't brimming with street vendors, but scratch the surface a little and you'll uncover the warungs. 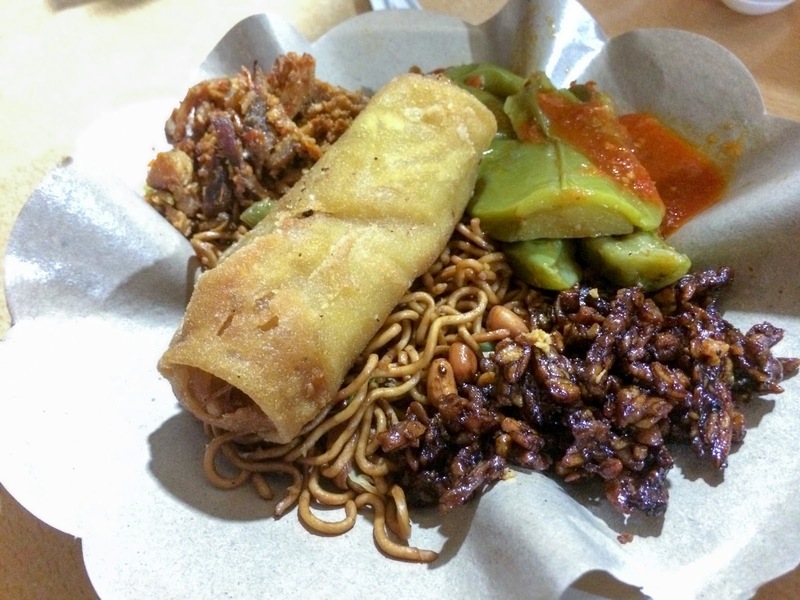 We ventured inland to Warung Muslim on the recommendation of our diving instructor. It's nothing but a basic structure, with a rickety wooden table and plastic chairs. Flies are abundant, and a more paranoid person would keep on walking but we persevered. 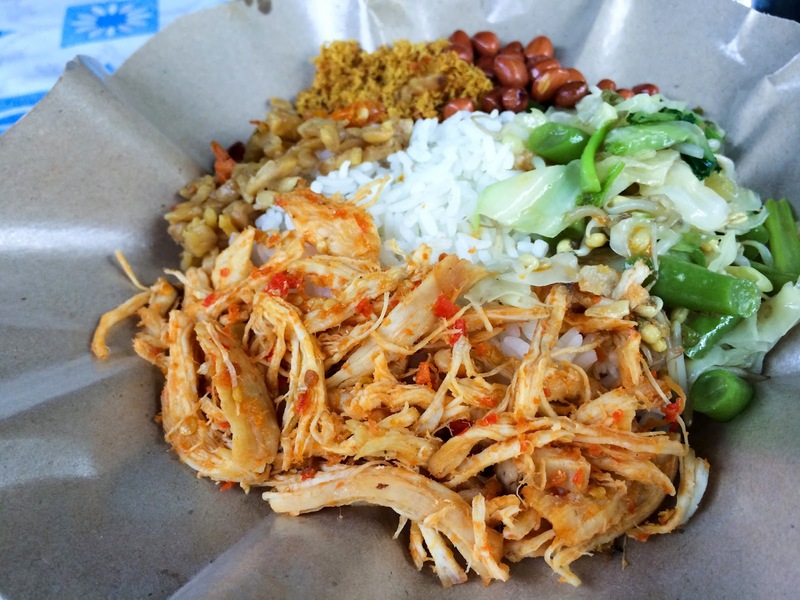 Nasi campur, or 'mixed rice' came with the choice of either fish or chicken curry. 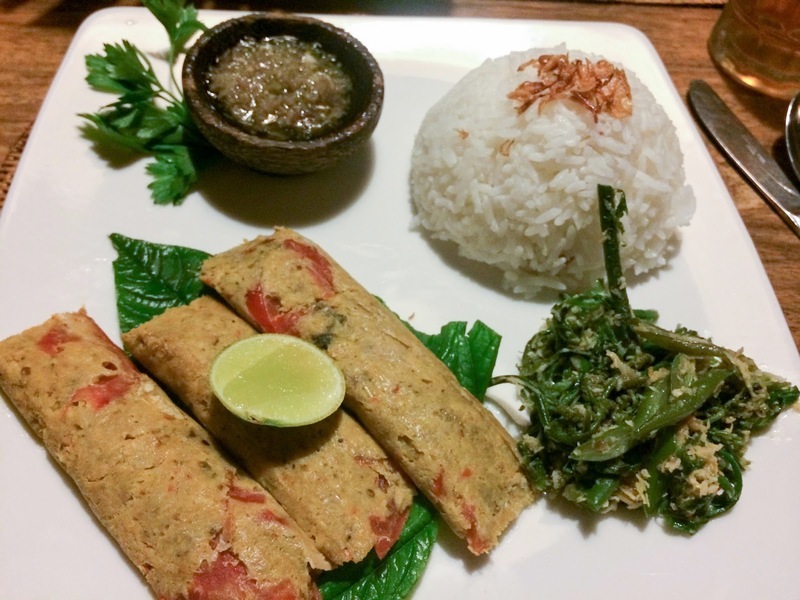 The fish was sardines, cooked in a spiced tomato sauce and central to the plate is a scoop of rice, while vegetables, roasted peanuts, tempeh and ground toasted coconut line the sides. It was so good I went back the next day for the chicken version (pictured). It cost me £1.25 each time. 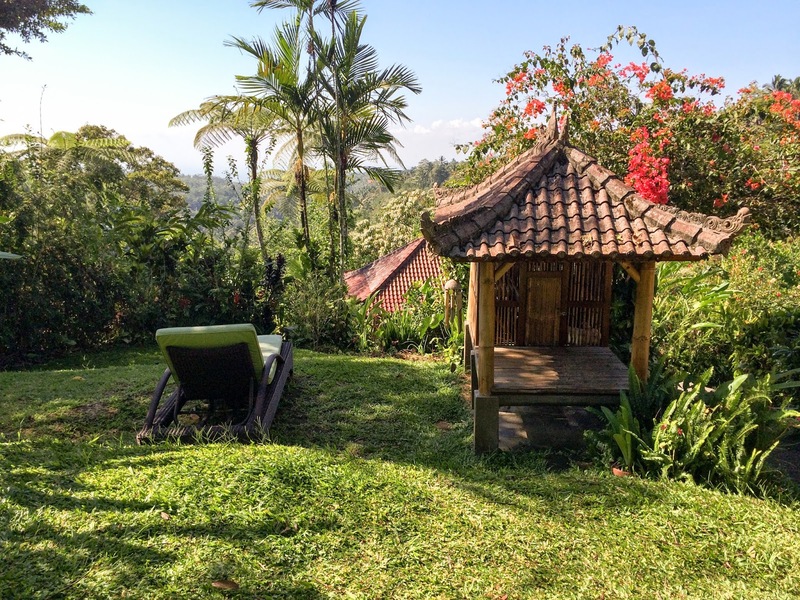 We headed off to the Balinese mountains, to stay at Sarinbuana Eco Lodge for the last nights of our trip. A 3 hour car ride was completely worth it, as when we arrived the tranquility and beauty of it soothed our sweaty and travel-weary selves. 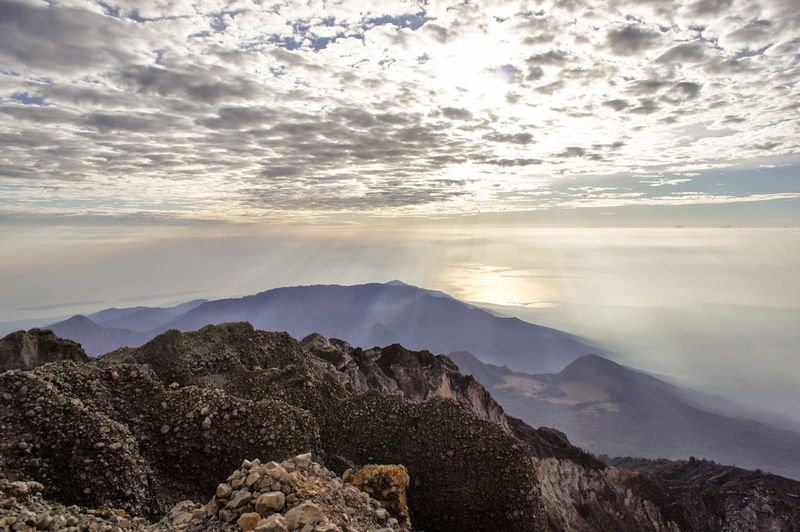 Located at 700m at the foot of Mount Batukaru, the days were still hot while the nights were substantially cooler - it was a joy to sleep under a blanket. 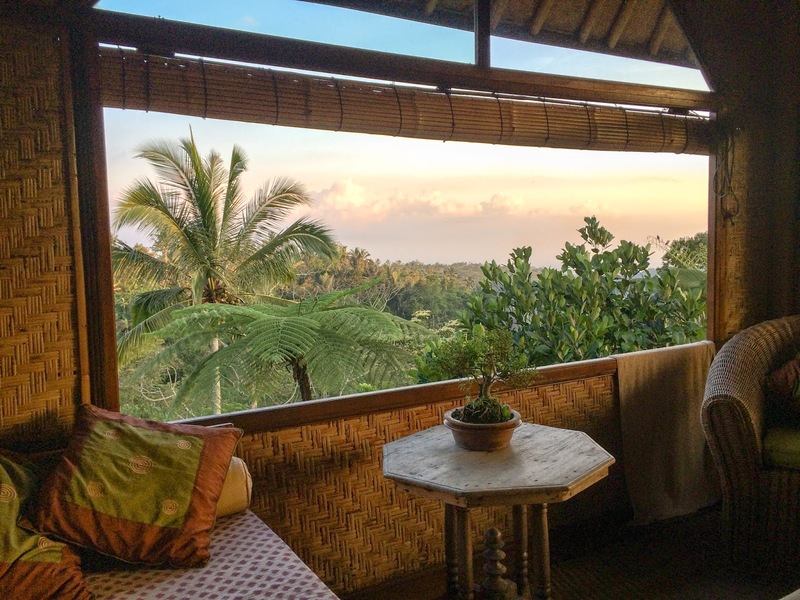 We stayed in the Treehouse, which was completely gorgeous - we had an open verandas to the jungle, as well as the bedroom. 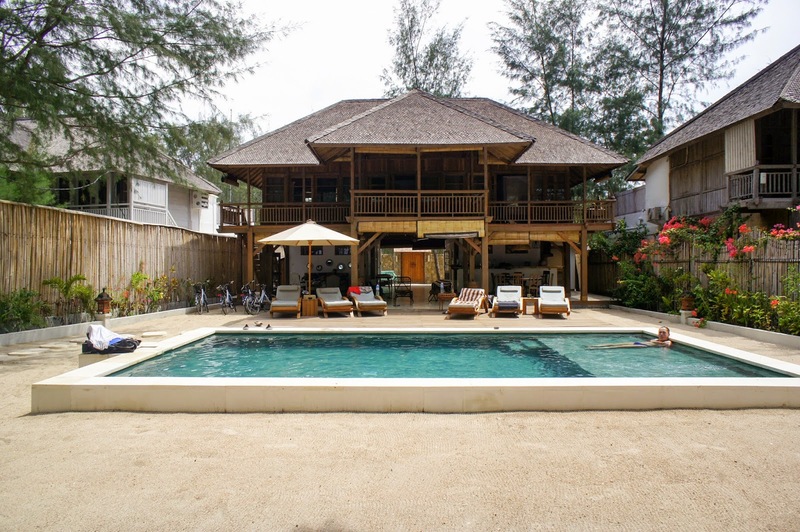 They're very supportive of the local community; staffed by locals, they also run various workshops like learning the Balinese flute, or wood carving, if you're into that kind of thing. As it's quite a remote location, I imagine if you'd stayed there for a length of time it would be appealing. In between watching the sunrise, doing a spot of yoga, reflexology massages and swimming in the natural water holes, we did a temple walk; our guide was incredibly helpful, and pointed out all the edible plants and fruits on the way. They grow all their vegetables on site, and as everything is prepared to order, we had to order breakfast, lunch and dinner during the mealtime before that. 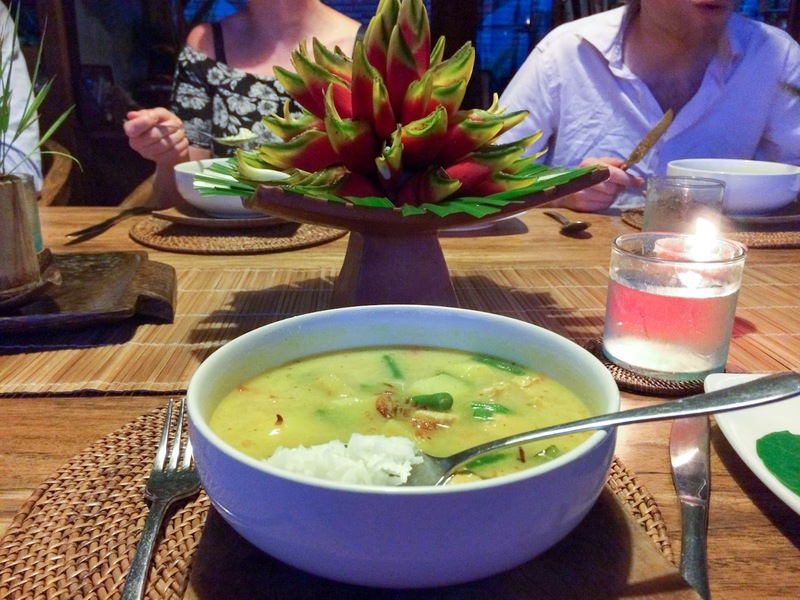 Balinese chicken curry was lightly spiced and fragrant, delicate and packed full of vegetables and potatoes. 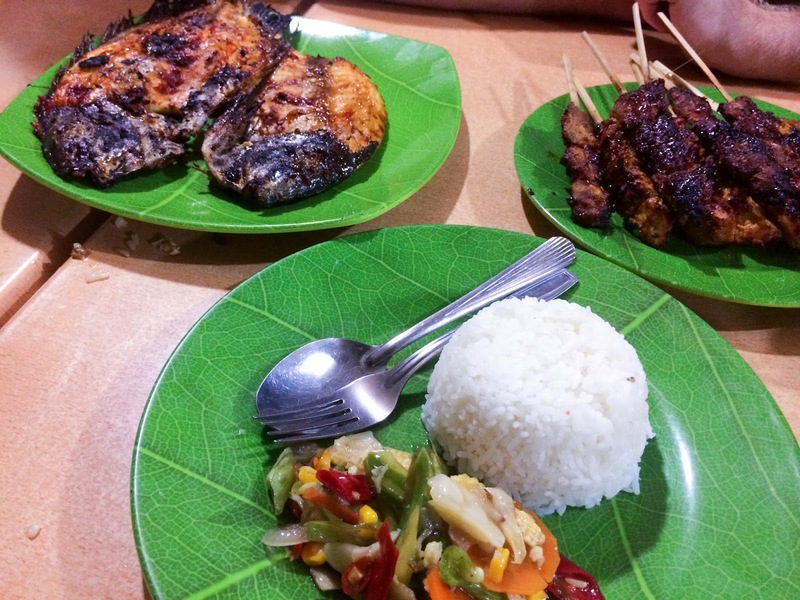 Ikan pepes was fish made into a paste, spiced and grilled in banana leaves. The accompanying sambal was made with lemongrass and green chillis - it was insanely delicious, and I'm glad I questioned them thoroughly for the list of ingredients to recreate at home (standby...). Breakfast was similarly refined and well presented - a fruit platter of pineapple, papaya, watermelon, banana and mango preceded some excellent pancakes, drizzled with palm sugar syrup. I thought I'd struggle as there were no savoury options, but I got by just fine. 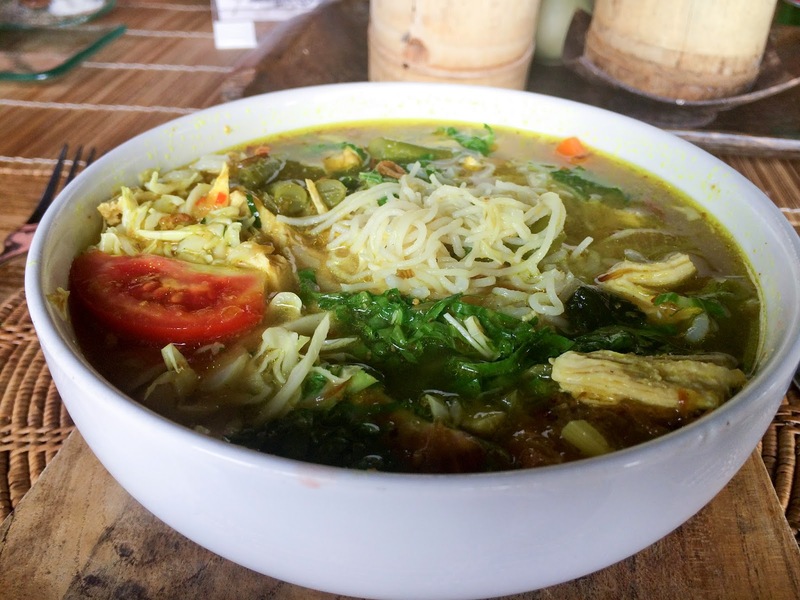 Soto Ayam was also on the menu, so it obviously had to be ordered. This was again different; still tinged yellow, but with beansprouts, some slivered kale, and tomatoes. Celery leaf gave it a herbal tone, and the soup was light and clear. The rice it was served with was total over-kill, but I am greedy so it was dipped in often too. 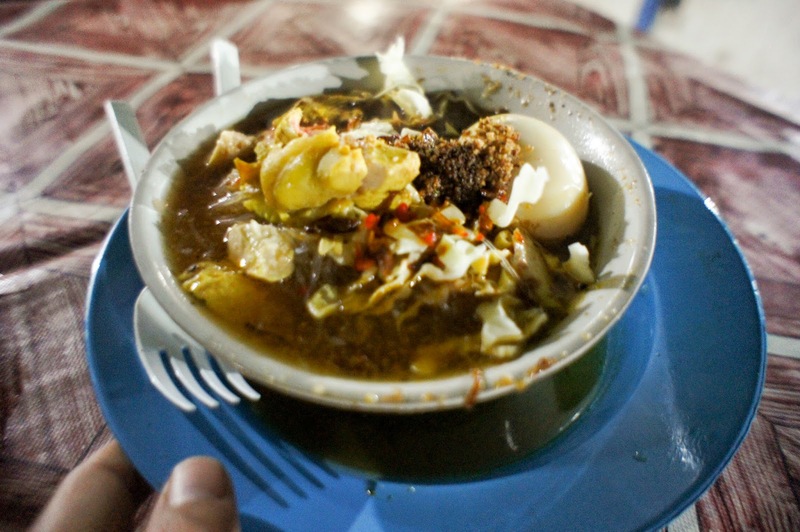 On my return, it took just a week before I missed Soto Ayam, and I set out to make up my own. 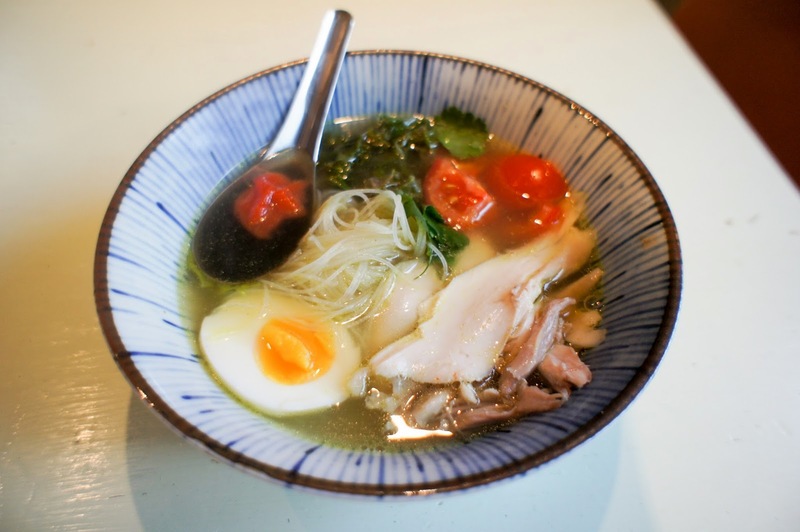 I enjoyed the lemongrass aspect of the ones I'd tried so that had to go in, though being SO packed the eco lodge's version was difficult to taste the soothing simplicity of the broth so I pared mine down a touch. I imagine during chillier months, a little more spice and perhaps coconut milk would be good variations. Place the chicken in a large stockpot with the lemongrass, kaffir lime leaves, carrot and celery sticks. Cover with water and bring to the boil on the highest heat. Turn the heat down to low, so it is on a bare simmer, and skim the surface for scum. Place the lid on and cook for 40 minutes. Take the pot off the heat and leave to cool for half an hour. Take the chicken out and place on a plate. Put the shallots, garlic and ginger in a pestle and mortar and pound with the tsp of salt until it turns into a paste. Add the turmeric and ground coriander and pound some more. Add the peppercorns and keep pounding until they're lightly crushed. In a large saucepan, heat the cooking oil until shimmering on a medium heat. Add the paste and fry for 2 - 3 minutes, stirring continuously. Add all the chicken stock, strained through a sieve, and simmer for 20 minutes without the lid on. While this is happening, assemble your bowls. Drain and divide the noodles equally. Take the chicken meat off the thighs and legs (discarding the skin) and break the meat up into bitesize chunks. The breast meat can be reserved for sandwiches or salads. Divide the beansprouts equally, and the tomatoes. Garnish with half a boiled egg, sprout tops, coriander and celery leaves. Heat the stock so that it is bubbling furiously for a moment and carefully ladle the stock into the bowls, through a sieve. Serve with traditional Indonesian condiments that we found on every table - kecap manis (which is soy sauce with a lot of sugar in it) and Sambal Asli, which bizarrely we couldn't find in any shops out there, but I found in Wing Tai in Peckham. Huh. Any chilli sauce will be good here. Serve immediately. Looks like an amazing trip (after the trek)!